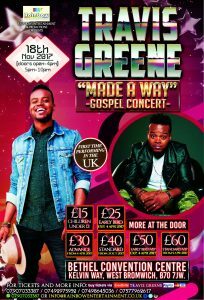 My dear Brothers and Sisters; Rainbow family and friends – on behalf of of Rainbow Entertainment and Promotions I am sorry to have to inform you that we have had to cancel and reschedule the Travis Greene event which was due to be held on the 18th of November 2017 at Bethel Convention Center to next year mid 2018. This was due to reasons beyond our control. We are working on an alternative and waiting for confirmation. We sincerely apologise and value your support you have given us over the years and hope that you will accept our apology. We will be issuing a full refund to all tickets purchased online and paper copy. Please do get in touch with us at info@rainbowentertainmnet.co.uk and instructions will be given on how to submit a request for your refund. Again we are very sorry for the inconvenience that we may have caused.